Jelixa is a Pop, House, Techno, Rock, and Funk recording artist sensation, born in Brooklyn, New York, and now residing in North Richland Hills, Texas. She has a unique sound of "Beta Music" that consists of a variety of styles and genres composed into a unique fusion of contemporary sounds. Jelixa is a treat to hear and watch perform live. Her music is hot and sassy with miles of sweet grrrl swagger. Overall, Jelixa's lush music and sassy vocals exude a cool urban vibe perfect TV and Film, high fashion, catwalk, and miles of romantic BF problems. At four and half years old Jelixa’s father past away, and a year later her mom moved to Texas and took Jelixa and Jelixa’s older brother along with her. But even after the death of Jelixa’s father, she would always dance to the Latin and Motown Music her mother played daily, and Jelixa would once again, as usual, be found dancing and singing to Marc Anthony, The Supremes, Michael Jackson, Prince, Madonna and other artist’s songs. While attending Watauga Middle School, Jelixa joined the Choir; it was obvious to those who heard and knew her that the love of music was in her! She was chosen by a group of girls from her school to play as “Jazmine” from the Disney Movie Alladdin, and she continued to stay in Choir all through Haltom High School as she competed in singing competitions and won medals. Once Jelixa graduated from High School she started going to college to Major in Physical Therapy. She later quit school to work at Sam’s Club/Wal-Mart for eight and one halve years so she could help her mother financially, for her mother was very much in need of Jelixa’s help. One unique thing that stands out about Jelixa, is that even while working daily at Sam’s Club/Wal-Mart, music was never far from her mind. So she decided that her favorite show “American Idol” was the place that could help her make her dream come true. She appeared on American Idol and sung a Christina Aguilera song, but unfortunately like many others, she was not chosen. So she decided the next year she would try again, but a tumor was found on her thyroid and she had to have surgery. Thank God it was not malignant, but an additional fear was brought on by what the doctors had said, “she’s at risk of her vocal being scarred”….all went well. Again destiny would play its part, but this time for the better. Through Jelixa’s mom, Jelixa met Michael Bell, Music Producer, who heard Jelixa sing and spoke to her about producing her as a Pop/House artist….surely Jelixa is now on her way to fulfilling her dreams. For all that she’s gone through, and for the committed love she has shown to her mother over the years, Jelixa is bound to be a start soon to shine! 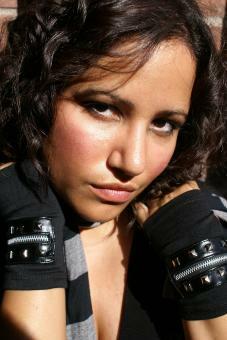 Jelixa’s desire is that the world will accept and love her music. With your support, her family and Bell Time Records, maybe one day her living room stage will become a real one, and the coffee tables she use to sing on will possibly become a precious memory for her to tell her future children about! Surely the recording of her debut single “Are You The One For Me” has a unique story line to fit with her bio. It was in her house living room that her vocals were produced, recorded and mixed to be heard by all of you!